Marcie Zlotnik, co-founder and executive vice president of StarTex Power, stressed the importance of customer service during a talk to the Bauer College Alumni Association. The key ingredient to ensuring customers keep coming back to your brand? Trust — that’s what StarTex Power co-founder and executive vice president Marcie Zlotnik told alumni from the Bauer College of Business over breakfast on Sept. 20. Zlotnik’s talk kicked off the Fall 2012 Bauer College Alumni Association (BCAA) monthly networking breakfast series and focused on the importance of providing quality customer service to all stakeholders, from employees and consumers to the community. 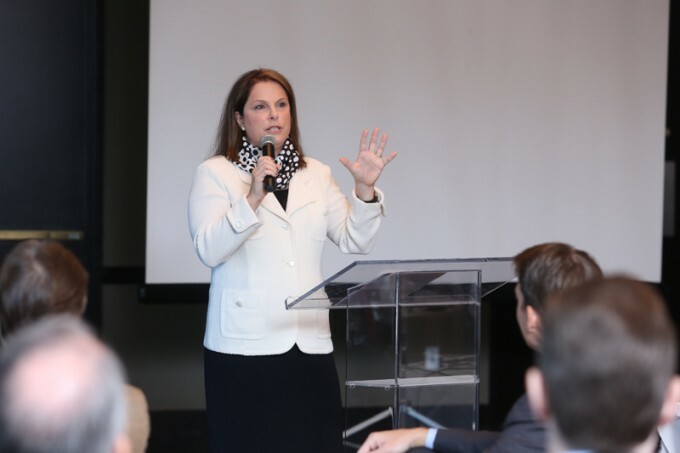 The event was held at the Houston City Club and presented by James E. Bashaw & Co.
Business owners shouldn’t focus on their needs, she added, but rather what is best for employees and customers. Since its inception in 2004, StarTex Power has received recognition for their customer service including the “Best Place to Work” by the Houston Business Journal for the past four years and was named a 2010 “Best Company to Work for in Texas” by Texas Monthly. Held monthly in the fall and spring, the Bauer College Alumni Association breakfast events provide alumni with access to speakers like Zlotnik and an opportunity to network with peers. On Oct. 18, BCAA will host Michael C. Linn, founder of LINN Energy, LLC. For more information and to RSVP, click here.